The DARPA Robotics Challenge, or DRC, kicked off today at the Homestead-Miami Speedway about 30 miles south of Miami. A total of sixteen teams from around the world are here to challenge each other today and tomorrow in timed trials, and to compete for funding from DARPA, the Pentagon's mad science arm. A seventeenth team, from China, hit travel snags and hasn't made it here yet. The Robotics Challenge represents the first time the bots have gathered to compete in physical challenges. They cut their teeth on a Virtual Robotics Challenge earlier this year in computer simulations, which led to DARPA down-selecting from over a hundred teams to just seventeen. 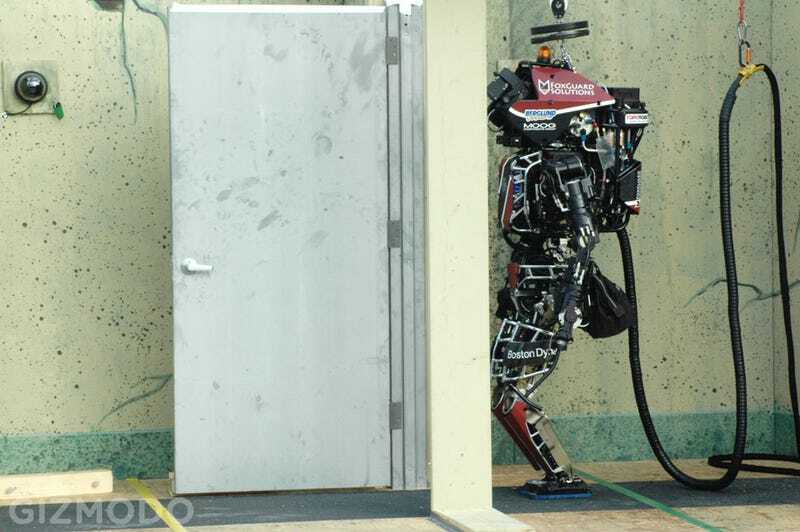 DARPA's goal with the competition is to develop robots capable of semi-autonomous operation in disaster zones. The program manager in charge of the competition, Gill Pratt, developed the program in response to the Fukushima nuclear power plant meltdown in Japan in 2011. "One of the things that happened was that human beings," said Pratt in a press conference last night, speaking of Fukushima, "were sent in to manually open some valves to vent the reactors because hydrogen gas was building up." The area was too radioactive, however, and the workers faced certain death unless they turned back. "Had they been able to open those vents, we believe," Pratt explained, "then the explosions that blew up three of the reactor buildings would not have occurred." Pratt emphasized the non-lethal nature of the bots themselves. "This is a non-military defense mission," he said. The tasks the robots are being called on to perform are basic for us humans, but extremely challenging for robots, especially since they will have to perform with minimal human supervision. The bots have to perform eight tasks in separate areas of the speedway. They have to open doors; remove rubble; cut through a wall with a power tool; turn a valve; connect a fire hose; climb a ladder; walk on uneven terrain; and, most challenging of all, drive a vehicle. The DARPA officials here at the speedway don't even know how many, or even if any of the teams will attempt that last feat. Brett Kennedy, the team leader for the NASA JPL team, Robosimian, said that his team, for one, didn't even intend to try that one. Instead, they will focus on collecting as many points as they can in the other tasks. Each task is worth up to four points. Bonus points will be given as tie-breakers for robots completing tasks in the shortest time. The second-most difficult challenge for the bots is the ladder-climbing task. The Atlas robot of Team Trooper (which has Lockheed Martin as a backer) made a valiant effort this morning to climb the ladder—really more of a steep staircase—and slipped off one of the bottom steps. After being caught by the rope "fall arrester," the machine was carted off by team members for adjustments before round two. Despite some appearances to the contrary, these machines are nowhere near Terminator status, at least not yet. They can barely walk. The robots that are bipedal are kept from falling down by ropes attached to their heads. Other bots get around on four legs and/or tractor treads for maximum stability. These are babies, with coordination equivalent, said Pratt, to human one-year-olds. One-year-olds with enough strength to do some serious damage. Robosimian team leader Kennedy advised me to stand out of reach of his bot's arms when I visited the team garage turning final testing and checkouts last night. "Robots right now are very inefficient," said Pratt. "If I were to compare the efficiency of a human being clambering around on rough terrain with the efficiency of a robot, the robots are around 100 times worse than an animal like a human being." Pratt hopes that by the next DRC event a year from now, the bots will be much more capable, but for this time out, they are being given up to 30 minutes to complete each task. Team members operating the robots have to do so out of view of their machines, looking instead just at monitors being fed video from onboard cameras and data that is sent over a degraded communications link. The idea is to simulate the conditions under which the bots might have to operate during a real-world disaster. The comms link alternates once a minute between a very good mobile phone connection and a very bad one, said Pratt. This means that the drivers of the robots must send quick, macro-level commands and leave the specifics of executing those commands up to the robots themselves. Six of the teams, the so-called Track A teams, had to build their own robots and also program them within the last 15 months. The 7 total Track B and C teams got a head start with identical Atlas robots built by Boston Dynamics, which they then had to program on their own. Four Track D teams, unlike the others, have gotten no funding from DARPA and are on their own building and coding their own bots. These are the true underdogs of the competition. One of the Track D teams, team Chiron, whose members hail from Salt Lake City, suffered a failure in the motors that drive its bot's limbs and was out of the running before it could even get started. The team got to work tearing down the motors, putting the pieces back together, and, if all went well, testing the fixes in time to be ready to get back in action in time for tomorrow's trials. The Chinese team still en route—team Intelligent Pioneer—is also a Track D team. That leaves only two Track D teams currently on the course: a team from Korea called KAIST, and Team Mojavaton, a group of volunteers out of Grand Junction, Colorado. Up to 8 bots will live to fight another day. The survivors will stay in the running to compete for a $2 million prize at the next DRC a year from now. Michael Belfiore is the author of The Department of Mad Scientists: How DARPA Is Remaking Our World, from the Internet to Artificial Limbs.